German Chancellor and leader of the German Christian Democrats Angela Merkel waves after her last speech as party leader on Friday in Hamburg, Germany. 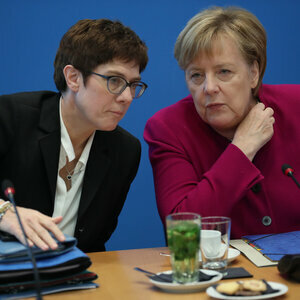 Merkel, 64, will pass the baton to Annegret Kramp-Karrenbauer, the 56-year-old general secretary of the CDU and strong supporter of the chancellor. “AKK,” as some Germans affectionately call her to avoid stumbling over her name, was Merkel’s preferred candidate, at least according to many German media and analysts because the chancellor never publicly endorsed anyone. Kramp-Karrenbauer narrowly defeated fellow party member, Friedrich Merz — Merkel’s staunch rival and the former leader of the party’s parliamentary group. Ahead of the vote, Merkel looked somewhat tired and uncharacteristically stumbled over her words during her 30-minute speech before the vote. 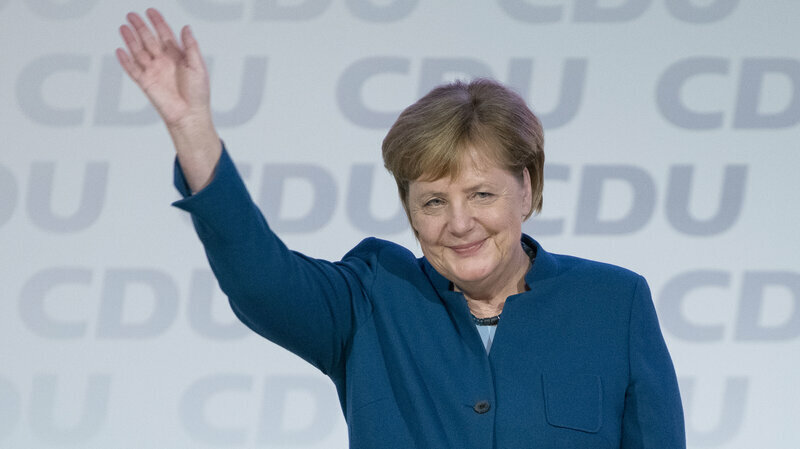 During her speech, Merkel urged the party to join together and show Germans it can lead their country through turbulent times of growing polarization and crises like war, terror attacks and climate change. Merkel said the CDU is well-suited to do so if it sticks to its core values, but at the same time remains open to change and looks to the future instead of the past. The delegates rose and delivered a lengthy ovation to their long-time leader, with some holding up signs that simply said: “Thanks, boss.” Merkel went back out on stage to acknowledge the crowd several times with nods, smiles and waves. 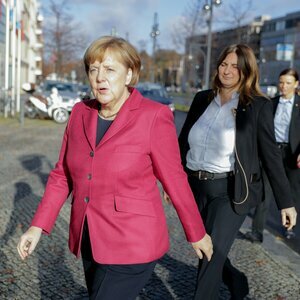 She eventually returned to the microphone and reminded the delegates they still had “a lot of work to do.” And that they did, as the three-way race for Merkel’s successor was a heated one. In the initial round of voting Friday, Kramp-Karrenbauer came in first receiving 450 delegate ballots, but she didn’t get a majority. So a runoff was held between her and second highest vote-getter Merz. The 63-year-old Merz advocates a more conservative, harsher approach to the party than Merkel, and in recent weeks, had advocated for a more combative approach to silencing those in the CDU center. Kramp-Karrenbauer narrowly defeated Merz in the run-off winning with 517 ballots to his 482. After the results were announced, a tearful Kramp-Karrenbauer hugged Merkel and gave her a peck on the cheek. Merkel, a mentor to the newly elected successor, smiled broadly and looked happier than she has in months, as she now faces a less politically turbulent transition when she hands over the reins of government at the end of her term as chancellor in 2021. Kramp-Karrenbauer, who was formerly the premier of the small German state of Saarland and fairly new on the national political stage, is pretty much assured to be the CDU’s successor candidate for chancellor in that national German election. But the mother of three also inherits the difficult task of ending the CDU’s lackluster showing over the past three years in local, regional and national elections, as well as winning back hundreds of thousands of voters. Most of them defected to the far-right Alternative for Germany over Merkel’s controversial decision to openly welcome asylum seekers back in 2015 when hundreds of thousands of Syrians, Iraqis, Afghans and others came to Germany and other European Union countries to escape war and poverty. After her win, Kramp-Karrenbauer immediately extended an olive branch to Merz and her other key opponent, German health minister Jens Spahn. Some German observers predict that even if her CDU party unites behind her over the next few years, Kramp-Karrenbauer has a long road ahead to persuade German voters and the greater European Union that she can be as stabilizing and powerful a chancellor as Merkel.